For more recipes and nutrition tips for your body type and individual goals, check out our free body type quiz here! Breakfast is often described as the most important meal of the day, but this saying is only true if you eat a nutritious and healthy breakfast. One of our V Shred Nutrition Coaches Kita is coming to you from our V Shred kitchen with a low-carb recipe that is sure to satisfy your taste buds! This 4-Ingredient dish is not only easy to make it’s also budget friendly! With little prep and bake time, in just 25 minutes, you can have your breakfast prepped for all week long. What is Kita making for you? Low-Carb breakfast Stuffed Bell Peppers! Today we are taking you out of the gym and into the kitchen! Most of you have heard the saying that weight loss is 80% diet, and that’s true for most people. If you want to see results that are quick, sustainable, and will last long-term, it all starts in the kitchen. And guess what..? It doesn’t have to be difficult, confusing, or take you hours slaving away in the kitchen. Eating healthy does not mean that your food has to be boring or lack flavor. You will see with this recipe, that there is plenty of flavor to allow you to enjoy what you’re eating while losing weight. Lets dive into this delicious recipe. Although there are only 4 simple ingredients, this dish is sure to satisfy you throughout the morning and keep you feeling full without getting that bloated, lethargic feeling. This recipe is loaded with protein and healthy fats that will rev up your metabolism and help you burn the body fat you desire! The ingredients are simple and easy to find at your local grocery store. Check out the full recipes ingredients and instructions below! Crack all 8 eggs into a mixing bowl. Add the shredded cheese and pre-cooked crumbled bacon into the bowl holding the eggs and whisk the ingredients as if you were making scrambled eggs. Once all ingredients are evenly blended, pour the mixture into each bell pepper cup until the cup is full evenly distributing the mixture between all 4 cups. 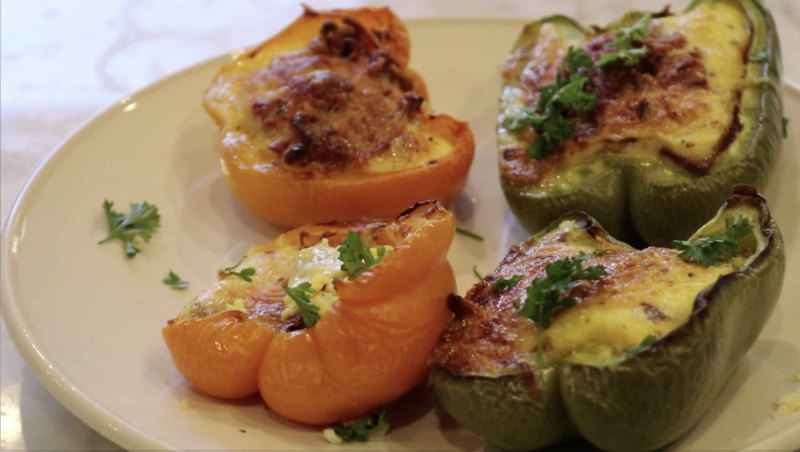 Top the filled bell peppers with the remaining cheese then add a dash of salt and pepper for taste. You can store these stuffed bell pepper breakfast cups in the fridge and have breakfast conveniently ready for you all week! If you loved this recipe, you have to take our free body-type quiz. Not only does each plan come with over 50 easy to use recipes just like this one, it also matches you with the perfect diet and training plan for your body type, based on your goals. Click the button below to take the free quiz and learn what will work for you to finally see results!